SUBHEAD: We continue to be damaged by these extremely cautionary nuclear catastrophes. 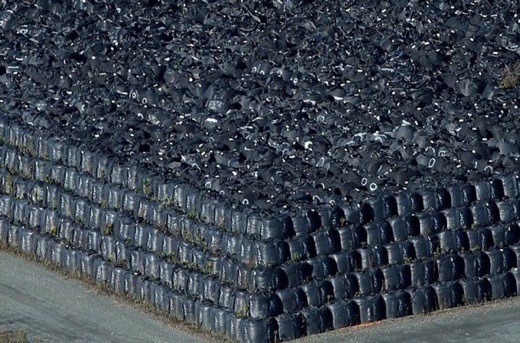 Image above: Black plastic waste bags of nuclear waste from Fukushimadaiichi nuclear plant disaster in 2011 stacked five high at the perimeter surround an inner pile of chaotically placed bags. From (http://www.catchnews.com/india-news/keep-your-nuclear-power-mr-shinzo-abe-we-can-do-without-a-fukushima-1449883672.html). With phenomenal ingenuity and extreme folly, technically-advanced humanity has managed to conceive and implement a technology that has done much harm to life, and will do much greater harm to life, and that even threatens our extinction. Whether suddenly through nuclear war, or through a pernicious slow motion assault on life's wondrous, intricate, amazing inner workings and accurate reproductive capabilities, nuclear technology is inherently, inescapably, anti-life. Given that the rest of the marvels of creation – that which has so far survived us – is also along for the ride, it's not just about us. One might wonder, if the rest of creation were capable of hope, if it would be clinging to the fading hope that humanity at this late hour would transform itself into a species characterized by a decisively dominant strain of sane, careful, sensible behavior, or, if it would be hoping for our demise, the sooner the better, come what may. If we are to extricate ourselves from the trap into which we have placed ourselves, it will take much more ingenuity, and much reduced folly. This piece is an incomplete overview of our situation, intended to boost general understanding of these subjects. Some reflections on essential reforms close out the piece. The unprecedented mass mortality of much life in the North Pacific Ocean in recent years has been given inadequate coverage by corporate mass media, and has not gained widespread public awareness. In local media close to the 'situation', there have been many reports of unusual numbers of deaths, of strange diseases, of mass disappearances of life forms. And sometimes these reports appear in national and international media. But such reports are typically brief, sporadic, disconnected from each other, and often narrowly focused. Poorly represented has been the scale and breadth of the devastation: But then, no one knows just how many whales and sea lions and walrus and sardines and sea stars and mussels and sea urchins and sea birds, and countless other creatures large and small, have in recent years died, starved, disappeared, ‘melted away’ in the water, rotted on the shores. And we mustn't forget humans' industrial scale ocean 'harvest'. The most revealing description of the situation on the Pacific coast of North America has been compiled by intrepid Canadian sailor and former diver Dana Durnford. In 2014 and 2015 he journeyed over 15000 miles by small boat to document the decimation of life in the tidal pools and along the shorelines of British Columbia. Note that it has been two experienced sailors, Durnford and Macfadyen, independent human beings who love the ocean and who have witnessed the disaster in the Pacific at close quarters, who have given us especially compelling descriptions of the situation. One might think that Durnford would have been lauded, especially in Canada, for his amazing determination to document, and to tell the world about, the situation along the Pacific shores. He has been largely ignored, when he isn't being vilified. Marine scientists have seemed stumped to explain unprecedented mass mortality and disease in and around the North Pacific. The scientists typically vary from distraught perplexity to stabs in the dark: musings range from we don't know what's going on, to climate change, fungi, bacteria, viruses, over fishing, cyclical ups and downs, acidic water, domoic acid, warm water and cold water. In fumbling for explanations for unprecedented recent death in the Pacific, there has been an obvious reluctance by scientists to assign significant suspicion to the unprecedented industrial/technological catastrophe which began in Japan at the Fukushima Dai-ichi nuclear reactor complex on the shores of the Pacific on March 11th of 2011. Four large nuclear reactors were destroyed, melting down and blowing up, and have for over five years released massive amounts of dangerous radioactive elements into the biosphere. Significant for what is happening now in the Pacific,a study published in 1971, authored by E. J. Sternglass, titled 'Fallout and Reproduction of Ocean Fish Populations', showed the huge impact that nuclear fallout from atomic bomb testing had on life in the oceans. In desperation, a large amount of sea water was sprayed onto the wrecked reactors. It is questionable whether this did more harm than good. The creation of durable spherical radioactive clusters of materials – buckeyballs – has been reported to be among the fruits of this labor. Some highly radioactive water has been collected in many hundreds of steel tanks of dubious quality. Much water sprayed went wherever water was able to go. It should be emphasized that TEPCO has earned a reputation for hiding and minimizing and distorting the actual situation. And the Japanese government has attempted quite successfully to suppress honest reporting of the situation at Fukushima. The destroyed reactors continue, and will continue, far into the future, to contaminate the environment with dangerous radionuclides. There remain unapproachable areas, and horrific problems defying solution. Desperately, millions of large plastic bags of questionable durability have been filled with radioactive material, and this massive effort has managed to temporarily confine a tiny fraction of the radioactive contamination emitted over the five-plus years since the catastrophe. Over the last months of 2015 and in 2016, Michael van Broekhoven's Allegedly Apparent Blog has shone a near solitary public light on evidence indicating that some globally significant nuclear catastrophe has occurred recently. The Fukushima catastrophe obviously merited, and now perhaps more than ever, merits extreme political, scientific, engineering, mass media and public attention, reflection, and concern, and our utmost intelligence in brainstorming; and, to what extent possible, an all out mitigation response. But this has not happened. So, not surprisingly, countless people are not even aware of the Fukushima disaster. And of those who do know about it, many think that the problem has been resolved, or is not all that serious. It has not been easy, from the very beginning of the nuclear age, to find out what's actually going on with nuclear mishaps, generally, because dishonesty and censorship have been the default position for the nuclear military and nuclear industry since its inception. So, for example, the World Health Organization, which cheerfully announced immediately after the beginning of the Fukushima catastrophe that no increased cancer risk was to be expected, made a secret agreement in 1959 with the nuclear lobby and promoter IAEA (International Atomic Energy Agency) to give the IAEA control over WHO pronouncements pertaining to radioactivity and human health. Since the beginning of the atomic age, humanity has been the victim of both nuclear-related deception and radioactive contamination. Ochiai's document includes the important point that damage from chronic exposure to radioactivity is strongly related to whether that exposure is through internal contamination. This critical difference between internal and external exposure to radioactivity has been largely ignored by 'official' bodies and pronouncements and standards regarding the health impact of radiation. Cancer risk is highlighted, then minimized. Little mention is made of the hundreds of other serious ailments which increased exposure to artificial radionuclides is implicated as contributing to. From Ochiai's document: [“... as a result of the Fukushima accident”] “All indications are that incidence of many diseases is increasing not only in Fukushima but also all over Japan.” Ochiai shows charts based on data from Japanese hospitals for incidents of various diseases for the years 2010, 2011, 2012 and 2013. At the Fukushima Prefectural Medical School, data is for the years 2010 to 2012. Here are the figures for 2010 (before Fukushima) compared to 2012 (two years after Fukushima) : cataracts up 227%; angina up 157%; bleeding in brain up 300%; lung cancer up 163%; esophagus cancer up 122%; stomach cancer up 129%; cancer in small intestine up 400%; colon cancer up 297%; prostate cancer up 300%. Ochiai included data from fifteen Prefectures re thyroid cancer. Rates went up in all areas, with Japan as a whole having a 148% increase from 2010 to 2013. Incidents of myocardial infarction increased in all 13 prefectures listed; Japan as a whole 151%. Acute leukemia increased 142% overall. The author comments that his data represents only the “tip of the iceberg”. On Oct. 15, 2015, Japanese Professor Toshihide Tsuda announced the results of an epidemiological study of thyroid cancer in Fukushima prefecture since the catastrophe, and described the increase as “drastic”. The increase was 20 to 50 times 'normal', depending on the specific area and amount of contamination, and this increase was far beyond what the WHO had predicted. Leaving Fukushima for the moment, what can we learn about the health repercussions from massive releases of artificial radioisotopes from the global nuclear catastrophe at Chernobyl in 1986? The book has been largely ignored by corporate mass media, and when mentioned, attempts have been made to denigrate it, belittling its competence, methods, and conclusions. This denigration is due to the threat that the document poses to the nuclear delusion: The Chernobyl study is not a good news story. The Chernobyl book above was based on approximately 5000 studies, but the authors point out that these were only a fraction of those available. Many of the studies were in the Russian language, and some have still not been translated. The document notes that Chernobyl radiation harmed all life forms studied. And the authors assert that at the time of writing the document, the problems were increasing on the whole, not decreasing. Thirteen European countries had over half of their area contaminated, and some European countries have areas that remain contaminated, nearly thirty years later. For example, 10,000 farms in the United Kingdom were contaminated. Four hundred million people live within significantly contaminated areas, and 5 million still live in areas of high contamination in Russia, Belarus and Ukraine. The quantity of deposition of dangerous radioactive material varied greatly from place to place, over the entire northern hemisphere. Many different types of conglomerations of radioactive elements were emitted. Marked increases in a myriad of non-malignant and malignant health problems, including damage to reproductive health and the immune system, have been observed and recorded in the populations exposed to Chernobyl contamination. Over vast areas and in diverse populations and in all age groups that experienced contamination, there has been greatly increased morbidity. In many instances this increase has worsened steadily over time. Prior to Chernobyl, healthy children were the norm in all countries in question. After Chernobyl, especially in places of heavy contamination, healthy children became fewer, with some areas now reporting virtually no healthy children. Contaminated areas of Belarus, Ukraine, and European Russia have seen the percentage of ‘practically healthy’ children reduced from 80 or 90% of the child population prior to Chernobyl, to less than 20% more recently. Markedly higher death rates, reproductive disabilities, low birth weights, and a wide range of illnesses and diseases, and greatly increased numbers of invalid children, were documented in areas of serious contamination. There was a continuing deterioration in the health of children exposed to serious radiation, even from the late 1990s into the new millennium. There were increases in stillbirths, miscarriages, infant mortality and congenital malformations in many countries following the Chernobyl disaster. The hundreds of thousands of people – the ‘liquidators’ - who worked in close proximity to the reactor site in the attempt to mitigate the disaster; have experienced extreme decline of well being and greatly increased morbidity. For example, for the Ukraine among liquidators about one in twenty remained reasonably healthy by 2004, and those suffering chronic illness increased 600%. Russian men, young and healthy prior to Chernobyl, and who participated in cleanup and mitigation efforts, suffered a severe decline in health, leaving only 2% healthy by 1992. By 2004 nearly two thirds of Russian liquidators were disabled. Accelerated aging was documented in both children and adults living in heavily contaminated areas. Diseases of the blood, circulatory and lymphatic systems increased markedly in populations living in areas of radioactive contamination, as did increases of chromosomal aberrations, mutations, and Down syndrome. Thyroid problems increased greatly, with 1000 thyroid problems for every thyroid cancer. The damage by Chernobyl radiation to the endocrine system was far greater than previously expected, with millions seriously affected. Immune system impairment strongly correlated with exposure to radiation. Marked increases in respiratory system problems were documented. A wide range of reproductive system disorders increased greatly in heavily contaminated areas. Serious radiation exposure was strongly associated with impaired brain function and mental health problems. There have been many surprises: for example, Cesium-137 has been far more persistent than predicted; hot particles are breaking down quickly into a surprising melange of radioactivity; Highly soluble Strontium-90 and Americium-241 are moving through the food chain much more rapidly than had been predicted. Levels of contamination in plants vary widely, even within species. There was increased and widespread genetic damage, tumour-like growth, and mutation in many plant species in areas of high contamination as compared to areas of low contamination. Since Chernobyl, in heavily contaminated areas, all resident animal species studied have exhibited increased genetic abnormalities and increased mortality, and generally, the same damage that humans have suffered. This will continue far into future. In less than half a year after Chernobyl, in heavily contaminated areas, marine species had decreased by up to four fifths of their pre-catastrophe numbers. Bird populations in heavily contaminated areas were greatly reduced. So where are we? Even without Chernobyl and Fukushima, we were not doing well, us talented, foolish, war-making humans. Neither to ourselves or the rest of life on the planet. The oceans would have been in trouble without Fukushima. And on land all the creatures that compete in any way with us, or whose death profits us – the lions and tigers and bears and elephants and giraffes and gorillas, etc – would have been in trouble at our hands had we never gone down the cursed nuclear path. The more fragile creatures, the butterflies and birds and bees and the rest, would be in trouble given a human globe-spanning culture that combines dirty technology and 'living better with chemistry' with a chronic inclination for war, greed, and a too general insensitivity to nature; even if we were without one nuclear bomb or reactor. But the atomic bomb and the nuclear reactor have introduced a new deadly circumstance. We have been teetering on the edge of nuclear weapons being used in a cataclysmic war since shortly after the second world war. And nuclear technology, which creates, and spread around the planet, countless new alien atoms that are inherently inimical to life, is also a pernicious step too far, even if nuclear war were to be averted permanently. As adjuncts to the bomb, many hundreds of nuclear power plants, civilian and military, have been built. There have been catastrophic accidents, with many accidents larger and smaller covered up, and lied about. At the dawn of the possibility of a new benign-energy age, at that moment in history when we have created the basis of a transition to a relationship with the natural world that is predominantly respectful and careful, some countries are building new nuclear reactors. And we still don't really know what to safely do with the highly radioactive results of running nuclear reactors. Fukushima and Chernobyl have been and remain and will continue to be catastrophic problems. But apart from those two majorly lethal conundrums, massive amounts of highly radioactive waste in thousands of locations remain a permanent disposal problem and danger. Future generations has been given the unwelcome and unasked for task of guarding, paying for, dealing with, being injured by, and having their lives and prospects and social options lessened by this most hellish means by which water is boiled to make electricity for us, and by which nuclear weapons' essential needs are met. So, wherein does our best chance lie of reducing the harm and risk of our nuclear folly? How do we provide the basis by which we could begin to dismantle our folly and reconstruct cultures that are viable. Note well: they did not base their hope on experts or oligarchs or generals or silly people who are enthralled by the illusion of their own extraordinary intelligence. They based hope on a well informed us. Implied in Einstein and Eisenhower's hope is that the broad public, well informed, has a far greater potential repository of creativity and common sense and decency and such – beneficent functionality - than any cult, tribe, institution or faction thereof. If indeed an informed public is essential, then modern mass media is largely a hope destroyer: the current use of mass media is largely as a 'public perception management' tool on behalf of demented control freaks and oligarchic wannabees; most mass media is used to brainwash, sell, propagandize, censor, mislead, confuse. Much of so-called journalism is a real-journalism-free zone. This is lethally dysfunctional and must be overcome. Significant steps in the right direction can be taken via intelligent political initiative, mandating and giving financial and legal aid to priority-sensitive free and full discourse and unfettered information in media. The real world is challenging enough at the best of times. It requires all the realism and intelligence and heart we can muster. We cannot attain a cultural predominance of sensible public policy via lies and censorship. If we are to salvage any kind of reasonably benign and propitious human prospect, we must achieve a dominant public discourse which is integrity and forthrightness based. Such honesty is the nemesis of criminals and tyrants, but the indispensable basis for sound public and personal decisions. Again, a fully well informed public is our best chance. And we might use direct democracy mechanisms – that is to say – a fully politically empowered public - to override the pernicious dysfunctions and corruptions of so many institutions. From Paul Craig Roberts' discerning perspective, every public and most private institutions in the United States are corrupt. The same problem is commonplace in most other countries. Often the basic source of dysfunction in institutions lies at the executive and managerial level, with political and corporate appointees serving agendas other than the broad public interest. Direct democracy procedures can be used to set primary policies, select real good leaders to executive positions, and to monitor them, and to replace the inadequate or corrupt people that have been appointed or have wormed their way into so many positions of power. Local and national direct democracy, informed by honest and free and full public discourse, offers the possibility of achieving genuine public-interest and planetary-interest cultural reform. We might also begin what has become a more and more desperate journey towards cultural sanity by recognizing the artificiality of all financial barriers for undertaking a full effort to fix deadly problems, especially the nuclear one: unlimited credit is just sane policy away. If trillions can be handed to criminal and dysfunctional banks, trillions can be endowed for beneficent and necessary public and earthly purposes. Another essential reform is to place corporations under, not over, the public and earthly interest. It is self-destructive madness to allow the narrow interests of corporations to trump essential human needs, and the well being of the biosphere. And those individuals who guide corporations and may reap great financial gain and social and political influence through corporate power, are largely immune from paying an appropriate personal penalty for corporate crimes committed and harm done. This too can and must be corrected. If we can't achieve essential basic improvements, but cling to a culture of deception, criminality, brutality and dysfunction, then the horrors of the last generations, such as the first and second world wars, the horrors of the war of aggression inflicted upon the innocents of IndoChina, the 2011 destruction of beautiful Libya, Chernobyl's disabled children, the Fukushima catastrophe, a terribly harmed North Pacific, and many more already achieved large crimes and big sorrows, are prelude to even greater horror. “The world is very different now. For man holds in his mortal hands the power to abolish all forms of human poverty and all forms of human life.” JFK, in his inaugural address. Video above: A drone buzzes Fukushima temporary a seemingly endless storage facility for bags of nuclear waste shown on Russia Times. From (https://youtu.be/UCP7PFT9coU). Dana Durnford's website: http://www.thenuclearproctologist.org/ https://www.youtube.com/watch?v=DLzbO6l4bfw for one of many podcasts. Durnford has not been hesitant to place primary blame on Fukushima for the massive death in the North Pacific. It has been repeatedly reported that all the explosions at Fukushima were hydrogen explosions. But this is at best extremely dubious: In the cases of reactors 3 and 4, especially, the explosions were powerful enough to cause massive structural damage, including to heavily reinforced concrete walls. Here are photographs of the results: http://cryptome.org/eyeball/daiichi-npp/daiichi-photos.htm ; here is a link to a video of the explosion of reactor 3: https://www.youtube.com/watch?v=7naSc81WSqA Note the yellow flash near midpoint of video, and the enormous detonation force. Among many who consider the hydrogen explosion theory dubious, Japanese reactor designer Setsuo Fujiwara has been quoted as offering that the explosion at reactor 3 gives clear evidence of being a nuclear explosion: http://enenews.com/reactor-designer-it-was-a-nuclear-explosion-at-fukushima-unit-3-plutonium-was-scattered-after-blast-abc-theres-willful-denial-and-lying-going-on-here-even-at-the-highest-levels How Reactor 4, which was not running at the time, was destroyed by a massive explosion also remains unclear. So much has not been explained; so many lies told: The melt down of reactor cores has been blamed on the failure of back up generators, but that doesn't explain the failure of the emergency systems for circulating cooling water, which were steam driven and not dependent on electricity. http://commondreams.org/views/2016/03/10/7-top-nrc-experts-break-ranks-warn-critical-danger-aging-nuke-plants And let us note well the illusion, more like the mad, irresponsible delusion, of being able to safely and competently store the dangerous radioactive materials for vast periods of time. Ask Hanford how it's doing with its never-ending story of gonna fix it tomorrow. Ask anyone else in more or less the same situation.